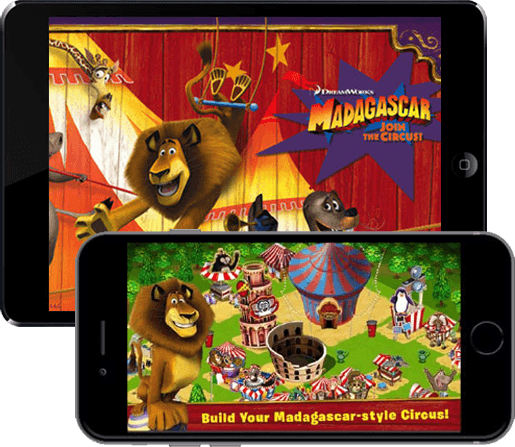 Madagascar: Join the Circus is a social simulation game aimed to cross-promote Madagascar 3. This collaborative effort of D3 and [x]cube proved to be a phenomenal success and saw over 2 million downloads in the first month. Here's how our leadership in game development helped D3 promote its iconic movie. D3 Publisher wanted to build a game that will be launched alongside the release of their upcoming movie Madagascar 3: Europe's Most Wanted to act as its promotional vehicle. D3 approached [x]cube to build 'Madagascar: Join the Circus', based on its movie story and iconic characters. With its wealth of experience in developing mobile social games and a range of intellectual properties, [x]cube helped D3 lay out its mobile game strategy, offered development services and marketing support to build the game and create the desired buzz among its target audience. The movie revolves around the Madagascar troupe performing center ring as they travel through different countries on their journey back home, and they also make sure that the circus runs in profits. Based on this concept, we created a simulation circus social game where players can build and decorate their wild Big Top attractions and clown around with Madagascar-style mini games featuring Alex the Lion, Marty the Zebra, Melman the Giraffe, Gloria the Hippo, and all their new and old friends. The mini games are also part of the circus where Marty will be jumping and collecting balloons. The game and movie are related as both were released almost simultaneously for effective cross-promotion. So What & How Did We Do It? [x]cube's contribution to the game was significant as the entire game design, engineering, QA and art have all been done in-house. Based on the references that D3 gave us, we've modified the art while keeping in mind copyright issues. Our team created different gestures of the characters, and the designers would check it on the shared Sprite Sheet where many frames can be called at once for the animation to happen. Though it was kind of challenging, it saved us time and the build size was less. We had regular calls with the client and showed them what we've done with their references, and shared ideas on how we want to do it. Confident and impressed, the client's team left everything to us - so the game, with all its mini games, was completely our idea. 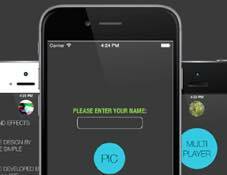 In terms of UI, the pre-production was done based on client's requirements. In the game, there are different cities and the circus is taken to these places. So the entire UI focuses on bringing out the differences between each city. We even built a ship for the US version and users need to build the entire ship to go to a different city. We came up with the idea of the ship based on user feedback and it suited our requirements of linking the cities. It was helpful as a user-engagement activity too. Users had to collect some bolts in order to build the ship, which they would get by completing a few quests and missions, before sailing out. Step inside the circus tent and put on a show for adoring fans in arcade-style acts like Marty's Striped Cannonball act and other games featuring your favorite Madagascar characters. Unlock new cities with future updates as your circus grows in size and popularity! Show off your growing circus empire and best performances to your friends on Facebook! Improve your acts and customize your expanding Big Top empire into the 'Greatest Circus Ever' by combining arcade mini-games and village-building gameplay! Build a ship and sail to different cities; enjoy mini-games and quests along the way. Play the game offline too with all its features and once you connect to the Internet, the session will be sent to the server. One of the most challenging parts of Madagascar was getting the Cocos2D-X code to run for both iOS and Android platforms. It was challenging because unlike Unity, 'write once and run everywhere' scenario was not a success on Cocos2D-X. 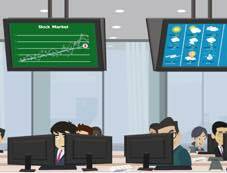 Developers had to make sure that written code is checked on both iOS and Android devices, on a weekly basis to get the code working on both the platforms. So, from the engineering perspective, iOS and Android versions were not in sync initially which was an issue, as our idea of releasing both the versions simultaneously didn't materialize. The main challenge, therefore, was to bring the two versions together. We faced issues while working on Sprite Sheet too - if one character/animation needs change, even if it's just one part of the character's facial expression or gesture, then the entire Sprite Sheet has to be changed, not just the frame. Despite these issues, we still continued with it because it is an effective tool for animation. The users who downloaded the game weren't coming back after 2,3 days. We developed a social simulation game where users had to build the circus at a time when players have already lost interest in such games because the market was inundated with similar stuff. Had we introduced some mini games initially, it would have been easier. Also, the players were getting a huge number of bananas (the currency) for free and so weren't interested in purchasing more. So from monetization point of view, we didn't gain much. Our other biggest challenges, therefore, were retention and monetization. We had to make sure that storyline of both is in sync. The game would have monetized well if we thought in a different line. As social simulation games were our strength, we thought 'Madagascar' can be built easily. But we later realized that there were some design flaws. We would have tweaked the concept had we known earlier. Our ship-building activity helped with retention as the users had to come back the next day to collect more tools and take the progress of ship to the next level. On the monetization front, we tweaked the values and a few other things to make sure that users don't get more bananas, and it helped. Even after four years, there are loyal users who are still playing the game and are paying money to purchase stuff. A publishing company called D3P served as a mediator between Dreamworks and [x]cube initially and gave their valuable inputs; it did help tweak and improve the game. As Android team worked on Cocos Studio and iOS engineers used native, we rewrote the entire code to make sure that both are in sync so that if something needs modification in the future, one team can take care of it. With the latest update, we will give a bunch of bananas for free to those active and loyal users who are still playing – as we want to help them complete their tasks and end the game on a successful note without having to spend money. 'Madagascar: Join the Circus!' 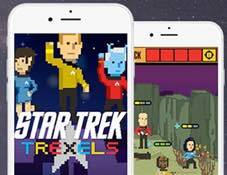 became the #1 game app in multiple countries for both iOS and Android. The game was downloaded over 2 million times in the first month of its release, propelling the title into top rankings on App Stores around the world. A huge number of downloads on the first day actually crashed our server which was a very big achievement. One positive outcome is that we released the Android version not only on Google PlayStore but also on Amazon. that sending push notifications won't always work, new attractions like ship-building and mini-games will motivate users to come back.